What roles do citizenship and participation play in integration? Tell us: What roles do citizenship and participation play in integration? 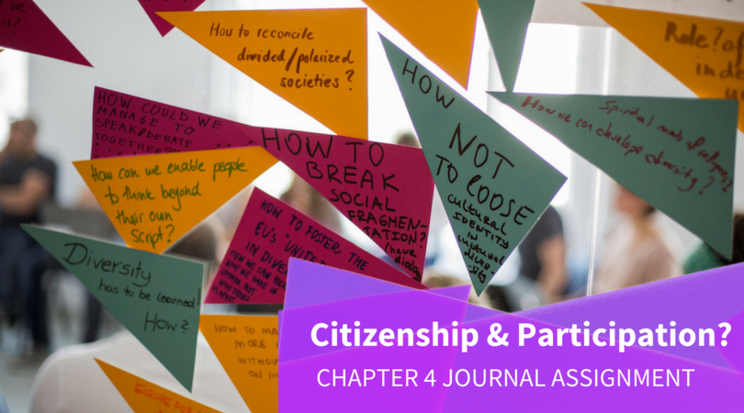 In Chapter 4, we've taken a look at some of the more tangible parts of the journey from 'foreigner' to citizen: naturalization, participation, and which policies and attitudes matter towards making someone feel as though they belong. We imagine that many of you have personal experiences with these topics or opinions on how they should be handled for those coming to your countries. We'd love for you to share them with the 'Us' & 'Them' course community here! - What types of major divides or cleavages do you most see in your society? Are these along the lines of immigrant vs. native or other groups? - How easy or hard do you think it should be for immigrants or refugees to gain citizenship of their new country? Do you think people should be able to maintain dual citizenship or do you see this as problematic for integration? - What is one thing that you find especially important to feeling like you belong to your society (or what do you think it would be if you moved to a new place)? "Diversity" is a very difficult word to define. In the current society in which I live, people who, to my mind are very close to one another in their mindsets and beliefs are considered to be "diverse". Is diversity having different cultural practices, different religions, different ways of thinking about the world? Is "diversity" politically defined? I think that it depends on the context and the specific situation. I grew up in a part of New York where there are many different cultures in many different religions and many cultural practices living next to one another. My parents were immigrants. Thus, diversity was a part of our household and of the work environment of both of my parents and of everyone I knew. In the society in which I am currently living, that is, eastern Croatia, the cleavage is one of ethnicity. Especially in this part of Croatia, this is difficult, as there are many mixed families. 25 years ago, wars were fought over this. These divisions still exist and are encouraged by politicians. The large number of asylum seekers who wish to come to this part of the world, or, rather, who wish to pass through it, create further divisions and cleavages. I believe that citizenship is an administrative matter rather than a sign of integration. It is a problem because governments make it into a problem, in my view. Thus, I have no problem with someone having as many citizenships as he or she likes. Integration is something different than citizenship. It depends on the external willingness of the society as well as the internal willingness of the person, both to accept the other. In coming into a new society, and I have lived in three or four of them now, the most important thing for me is being able to speak to my neighbors in a friendly way and having them accept me for who I am and being able to accept them for who they are. That, to me, is the most important part of belonging. Hi Charles, wow, what a change from NYC to East Croatia! Thanks for sharing your unique experience and perspective. You mention having no problem with someone having as many citizenships as they like, does that mean for you there should be absolutely no limit? I've personally never met someone with more than 3 and have 2 myself. How about you? Hi Sophia, It is indeed a change from NYC to this part of the world. I haven't really lived in New York since 1977. I see the perspectives of people I know, and sometimes think that I live on a completely different planet. In regard to your specific comment, yes, I do think that there should be no limit. I have two citizenships and could get a third. I hesitate, simply because the third would not really have positive effects for me and would require more bureaucracy, which I hate. I've begun to think of patriotism as complex brainwashing. I see flags as pornographic objects to which children and others should not be exposed. I see national anthems as obscene songs. Why? This all causes hatred and division. While it gives security to some people, it creates too much division, in my view, especially when taken to the lengths that the majority of politicians do. A friend of mine, a marvelous worker for peace and reconciliation here, who unfortunately committed suicide about a year ago, used the greeting "palisood"- peace and love in spite of our differences. Citizenship and nationalism work against that.